Lightly salt the beef fillet and vacuum along with the olive oil and rosemary. Cook sous vide for an hour at 54 °C in the fusionchef water bath. Remove the meat from the vacuum bag and keep the juice. Sear the fillet from all sides in a pan. Take out and keep warm. Fry the sliced mushrooms and halved pearl onions on both sides in a pan, take out and keep warm. Add the demi-glace, vegetable stock, meat juice and pickle juice to the pan and boil down until the gravy dissolves. Add the mustard, remove from the heat and mix in the sour cream. Season with salt and the freshly ground black pepper. 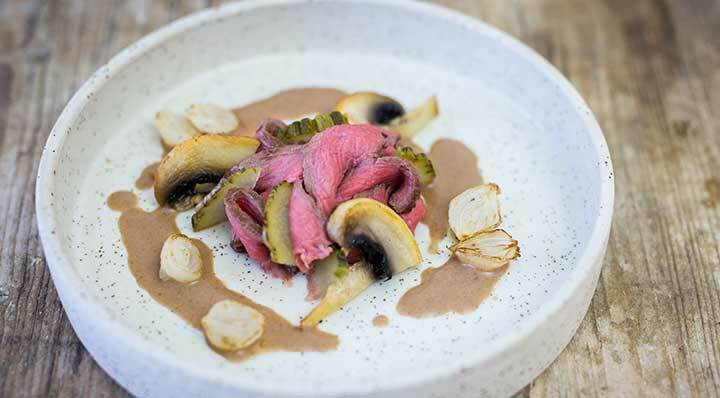 Finely slice the fillet and arrange with the mushrooms, pickles, pearl onions and sauce. This recipe was kindly provided by Annette Sandner.